The most common questions we receive from customers in our shop are often related to the selection and use of the proper clothing. 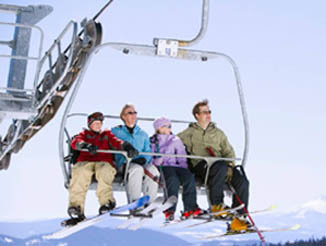 It is important to be prepared for the various and often harsh elements that a skier or snowboarder encounters on the mountain. We have a few suggestions to help you make your day a success. You just need to remember three words, Layers, layers, layers. Layers can be added for warmth or removed to avoid perspiration and subsequent chill. How do you choose the right layer? There are three important layers to consider: wicking, insulating and weather protection. Wicking layer: This is the layer worn next to your body. It should fit you snugly (not tight) in order to effectively wick moisture away from your skin and pass it through the fabric so it will evaporate. This keeps you warm, dry and comfortable. Look for thermal underwear made of a synthetic – usually polyester – fiber that has “wicking” power like Polypropylene or Silk which is a good, natural fabric that has wicking abilities. Insulating layer: This middle layer keeps heat in and cold out, which is accomplished by trapping air between the fibers. Popular insulation materials include: Fleece, a synthetic material which maintains its insulating ability even when wet and spreads the moisture out so it dries quickly; and wool, which naturally wicks away moisture. Protection layer: It is essential to have an outer layer, jacket and pants, that is windproof and at least water-resistant and should be able to be ventilated. Gore-tex and other similar fabrics have a thin polymer coating which has pores that are large enough to allow perspiration to pass through but too small to allow water droplets through. The other approach is to have a waterproof garment with sufficient ventilation openings to allow water vapor to escape. Don’t wear jeans or cotton pants. Denim is not waterproof, so water will soak through and you’ll end up cold and wet. Primaloft, Microloft and Thinsulate are synthetic fibers that are popular choices for outer layer insulation in jackets and pants. When it comes to the protection layer, there are many choices available from fully insulated jackets and pants to just lined clothing. Socks: Keeping your feet dry is essential to keeping your feet warm. Socks are made from a variety of materials, including polyester, silk, wool and nylon. Resist the temptation of putting on too many pairs of socks. You’ll restrict circulation and actually cause your feet to get colder. Also, a fold or bump in the sock can create a painful pressure-point in the boot. One pair of lightweight or medium-weight socks with wicking properties similar to long underwear, works best for skiing. If it is really cold a thin polypropylene liner sock next to the skin will wick moisture away and then a wool/nylon blend sock can be worn over for maximum warmth. Hats or Helmets: You can lose a great deal of heat (up to 70%) from the head, so wearing a hat, headband or helmet is essential when it’s cold. The adage – if your toes are cold, put on a hat – is true. A fleece neck gaiter or facemask is a must on cold days. Gloves and mittens: Look for gloves and mittens that use waterproof, breathable fabrics. Mittens, in general, are warmer than gloves, but offer you less dexterity. It is also useful to have an inner glove liner with an outer shell to give you layering capabilities. Sunglasses and goggles: 100 percent UV protection sunglasses protect your eyes from damaging solar radiation. Snow, or any other reflective surface, makes ultraviolet (UV) rays stronger, while increased altitude also magnifies the danger. On flat-light days or when it’s snowing, goggles are vital. They protect your eyes and special lens colors increase the contrast so you can properly discern terrain features. Goggles should form an uninterrupted seal on your face, extending above your eyebrows and below your cheekbones. Watch for gaps, especially around your nose.